In our last episode, we watched a documentary. This episode, we watched a mockumentary! We showed Jena a film by a group of gifted comedians who have sort of mastered the genre. 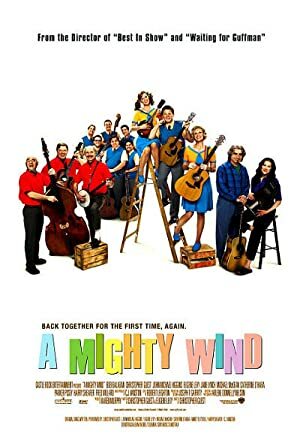 A Mighty Wind is a fabulously funny film about folk music. Created by Christopher Guest and Eugene Levy, it has a smart approach to the topic and even manages to be poignant every now and again. It’s one of Tim’s favorite movies. We hope it will be one of yours as well! Our next episode will be about The Maltese Falcon! Plot: Mockumentary captures the reunion of 1960s folk trio the Folksmen as they prepare for a show at The Town Hall to memorialize a recently deceased concert promoter. 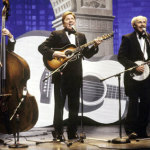 By the way: Hidden in the Mighty Wind DVD is a hilarious Easter Egg. They include the news article from when Mitch was first hospitalized. If you read the fine print, it turns out that he may not have been coming to Mickey’s defense; he just got in a fight by accident! This sort of fits with her romantic view of how he was her knight in shining armor, and (as we see in the film) the love poem that she memorized was his flowery way of asking for a drink of water.